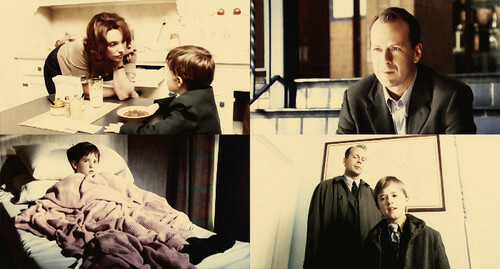 The Sixth Sense. All imej and characters belong to Barry Mendel Productions, Hollywood Pictures, and Kennedy/Marshall Company. Wallpaper and background images in the The Sixth Sense club tagged: shyamalan the sixth sense m night shyamalan bruce willis haley joel osment tony collette fan art. This The Sixth Sense fan art might contain tanda, poster, teks, papan hitam, chalkboard, berpakaian seorang, guaman, seluar guaman, pantsuit, orang baik berpakaian sut, and penekan seluar.